Erm, that would be breakfast, dinner, and dessert. Believe me, lunch isn’t worth the gritty iPhone pic. 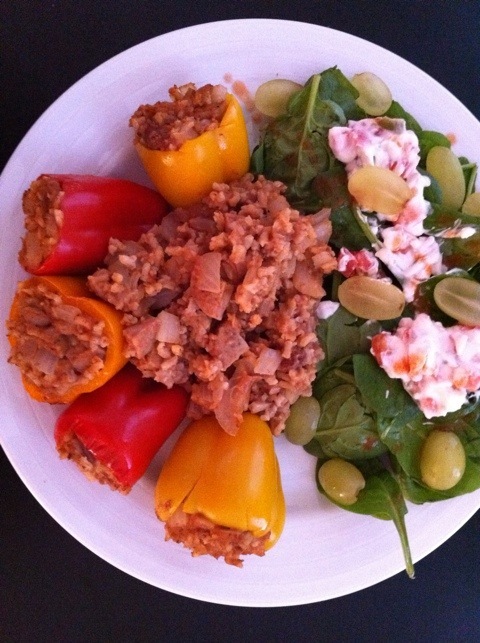 Today was tuna salad with mixed greens & balsamic, broiled tomatoes, and a cup of cottage cheese & froot. But breakfast, dinner, and dessert?? Definitely photo-worthy. Let’s start at the beginning: breakfast! 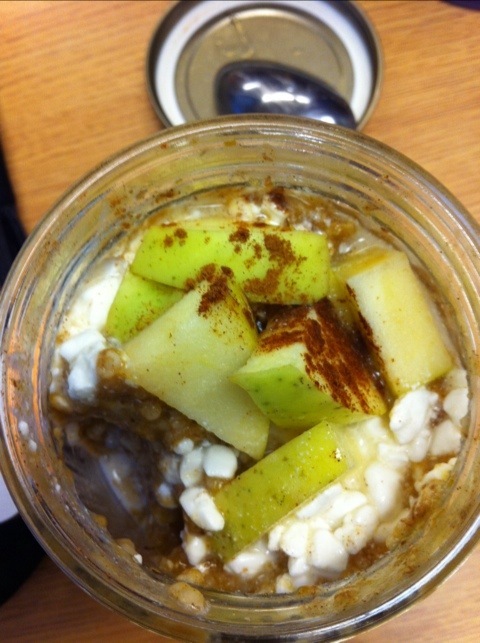 Pumpkiny oats with apple chunks, lots o’ cinnamon, and cottage cheese. Love this combo!! 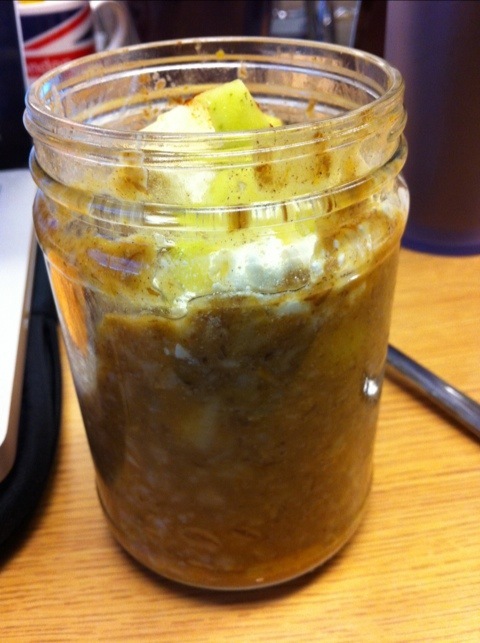 Spicy-sweet pumpkin meets thick, creamy oats meets tart apple bits meets cool, milky cottage cheese. I’m sorry, does that sound gross? 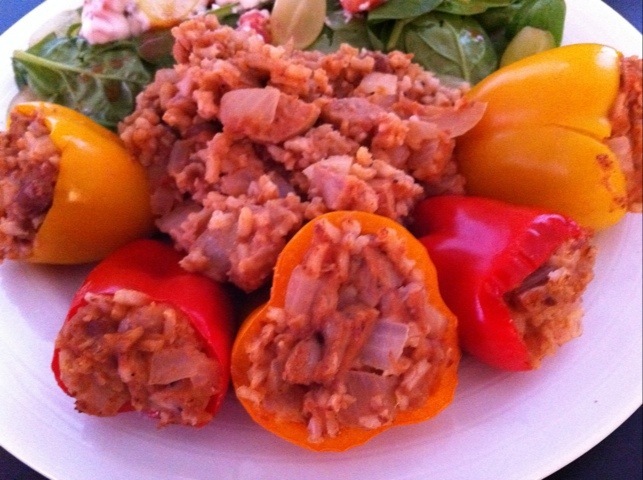 Tex-Mex stuffed bell peppers! I’d never done this before tonight, but an impulse purchase of baby sweet peppers from TJ’s the other day got me thinking. All I did was boil the rice, mix it with chopped onion, chicken sausage, and refried beans. Then, I added a few several dashes of Frank’s hot sauce and a sprinkling of cheese to really bring it all together before stuffing the peppers and throwing them in the oven at 400 degrees for about 12 mins. As you can see, there was plenty of stuffing left for having straight-up. 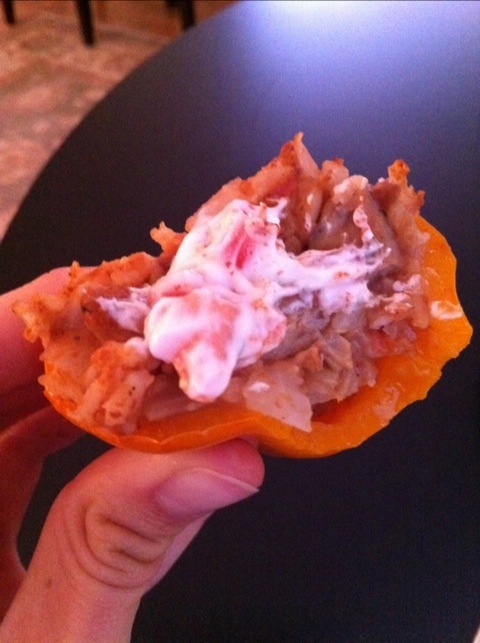 The side salad with yogurt + salsa + hot sauce as my “dressing” provided the perfect topping material for the peppers. Definitely doing this one again! And last, but not least: dessert. 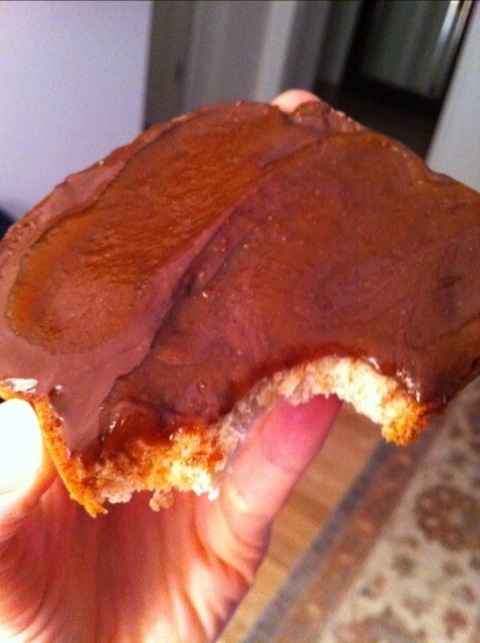 That would be toast slathered in dark chocolate peanut butter & pumpkin butter. If you’ve never heard of/seen pumpkin butter before, no, it is not pumpkin puree mixed with butter. It actually has ZERO butter in it. I’m pretty sure they just call it butter because it has the supple texture of butter…but really, it’s just pumpkin puree that’s been cooked down for hours and hours with sugar and spices. Deeeeelish.